In the thick of the Viennese modern age, exquisite cafés are competing for customers. Inspiring artists, important politicians, and tourists from all over the world are populating Vienna and in need of a hotel room. This is your opportunity to turn your little café into a world famous hotel. Hire staff, fulfill the wishes of your guests, and gain the emperor's favor. 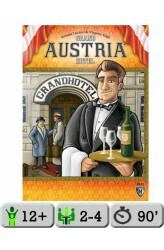 Only then will your café become the Grand Austria Hotel. The start player rolls the dice, sorting them by the rolled number and placing them on the corresponding action spaces. On a turn, a player chooses one of the six actions and carries it out. The number of the available dice in the corresponding action spaces determines how much the player gets from the action. 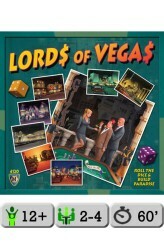 They then remove one of the dice and can carry out add..
You and your opponents represent powerful developers in a burgeoning Nevada city. You will earn money and prestige by building the biggest and most profitable casinos on "The Strip," the town's backbone of dust and sin. You start with nothing but parking lots and dreams, but from there you build, sprawl, reorganize and gamble your way to victory. Score the most points investing in the most profitable development companies and putting the best bosses in control of the richest casinos. Put your dollars on the line . . . it's time to roll! The game board is broken into 8 different areas, each consisting of a number of empty 'lots'. 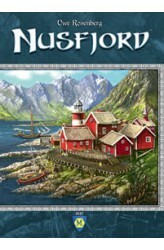 Players build lots by paying money and placing a die of the value matching the one shown on the lot's space onto the lot, along with a casino tile of one of..
Nusfjord by Uwe Rosenberg takes the players into the breathtaking world of the Norwegian fjords, where they manage their small fishing companies and build ships for their fishing fleet. To do so, the players must cut wood in the forests, which also makes room for the various buildings that help them with their endeavors. Short term gold can be gained by selling shares of one’s company. Buildings and gold are worth victory points and whoever has the most of those at the end of the game wins. The main drive of the game is the well-established worker placement mechanism, accompanied by a clever distribution mechanism for the fish captured by one’s fishing fleet. First, the village elders get their fair share of fish; then each shareholder is given a dividend. 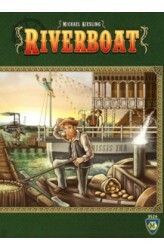 The remaining fish goes i..
Riverboat posits each player as the owner of a 19th century farm on the bank of the Mississippi River. You need to organize your workers to ensure that the fields are ordered according to their type and harvested when ready so that the goods can be shipped to New Orleans. In more detail, the game lasts four rounds, and at the start of each round players draft phase cards until they're all distributed. The phases then take place in numerical order, with the player who chose a phase being the first one to act. In the first phase, players place their workers in the fields, with each player having the same distribution of colored field tiles, but a different random placement for each player. In phase two, players organize their crops, trying to group like types together, with some .. In The Colonists, a.k.a. Die Kolonisten, each player is a mayor of a village and must develop their environment to gain room for new farmers, craftsmen, and citizens. The main goal of the game is full employment, so players must create new jobs, educate the people, and build new houses to increase their population. But resources are limited, and their storage leads to problems that players must deal with, while also not forgetting to upgrade their buildings. Players select actions by moving their mayor on a central board. 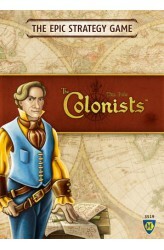 The Colonists is designed in different levels and scenarios, and even includes something akin to a tutorial, with the playing time varying between 30 minutes (for beginners) and 180 minutes (experts). https://www.youtube.com/watch?v=sCypEY7nHJk .. The year is 79 A.D. Pompeii, sitting at the foot of Vesuvius, is at the high point in its development. People come to the city from far and wide to try to make their luck in the city. So far nobody has dreamed of the danger that will bury all of their dreams under mountains of ash just ten years later. Who will survive the eruption of Vesuvius unscathed? 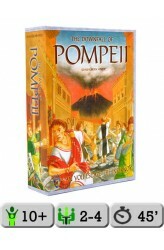 The simple rules make it easy to get started with The Downfall of Pompeii, a game in which a lot of tactical know-how is required – along with a little luck – in order to bring your pieces out of the city at the right time. The game falls into two halves: before and after the eruption of Vesuvius. Before the eruption, players play cards to place their pieces in buildings. After the first eruption, they can also place as many rel..